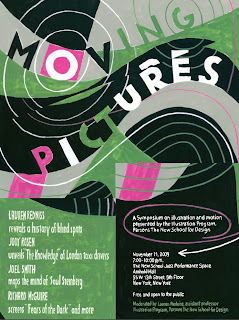 Janet Kershaw: Happy New Year and New York in retrospect/Moving Pictures Symposium. 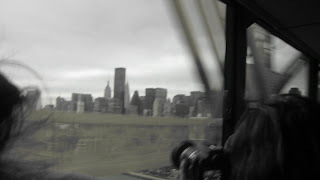 Happy New Year and New York in retrospect/Moving Pictures Symposium. New York revisited in retrospect. Looking back over the Brooklyn Bridge. We are still thawing out after the complete "white-out" here in England. 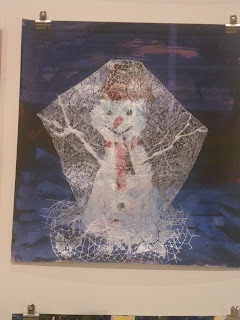 Snowman in lace camouflage is by Andrew Foster. 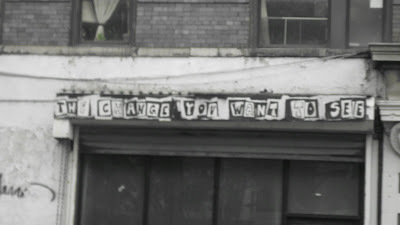 This bit of text was spotted one afternoon in Brooklyn NY. It says "The Change You Want to See"
I loved the way in seemingly unrelated subjects of the three speakers were interwoven; Lauren Redniss spoke about camouflage, Joel Stein was an expert on the work of Saul Steinberg, Jody Rosen talked about "The Knowledge" of London Taxi drivers, and Richard McGuire was a genius in animation. Lauren Redniss spoke about inattentive blindness, after she had showed us a video clip where virtually the whole audience failed to see a gorilla walking across the screen, because they were told to count a white ball being passed from one person to the other. 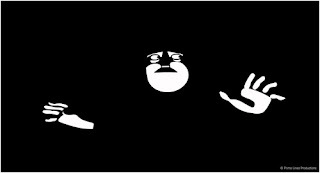 What happens when you don't see something right in front of you, when you think you are being observant? The mind distorts and our perceptions change quickly. Next was a video of the way a cephalopod can mimic its background until it is completely invisible to the eye. We then looked at "razzle dazzle", camouflage used on ships during the war, the SS War Penguin which was painted like a zebra. The idea of increased visibility as protection, and breaking up form to confuse the eye. The visual field is flooded with so much information, which is the opposite of the type of blending camouflage used by a cephalopod (squid), and concealment and subterfuge no longer hide identities. To further this idea, she suggested that the war ship's camouflage arrangement between the fluctuations of the sea was constantly changing the arrangement of the shapes as it moved through the waters, and therefore could be called an animation of the moving image. 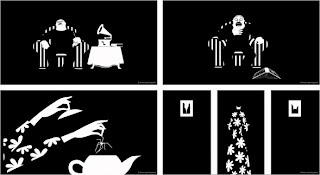 Richard McGuire spoke about his animation (Fear(s) of the Dark. 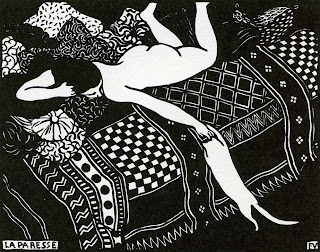 His influence for the moving image in this work was the Swiss artist Felix Vallotton. Stills from Fear(s of the Dark. Felix Vallotton's black and white work, almost dazzle camouflage here. 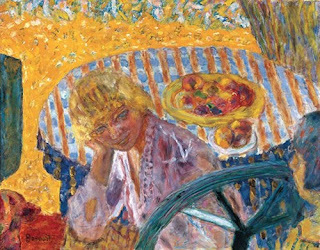 Lauren Redniss spoke about the work of Bonnard, and how his paintings are saturated with colours. 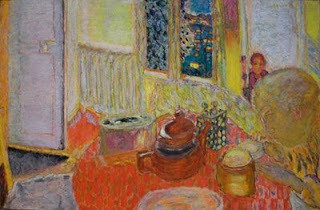 He often had figures in his paintings, although they were half integrated with the overall pattern of colour. She also suggested that his relationship with two women in his life meant that he often placed both of them in the same picture, although one was usually quite "camouflaged". She suggested his work is a time-based art, it rewards the viewer that slows down and unfolds the layers of narrative. See if you can spot them. 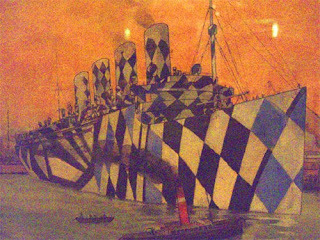 Painting of dazzle camouflage warship. 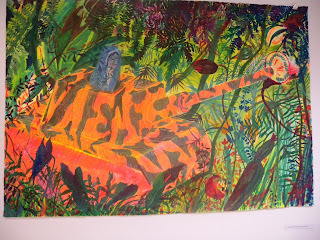 A "camouflage" painting by Andrew Foster from his recent exhibition "Blessed in Thy Sight", Furnival Gallery, Sheffield.